3D Printing is taking over the world. It’s popular for teaching design in schools, because students can learn to create 3D objects on a computer, and then see their designs take shape in plastic. But 3D printing is more than just plastic novelties. Creators are using the technology to work in metal, cement, and even food. And now one company has 3D printed a house. 3D printing is a way of creating three-dimensional objects using computer-assisted design. How does it work? First, someone creates a three-dimensional design using special software. One of the most popular design platforms is TinkerCad, which is both free and online. Next, the user transmits the design to a 3D printer. Then, the 3D printer turns the three dimensional design into two dimensional “slices.” Finally, the 3D printer uses thin layers of the user’s material of choice to assemble the object by stacking the slices one on top of the other. 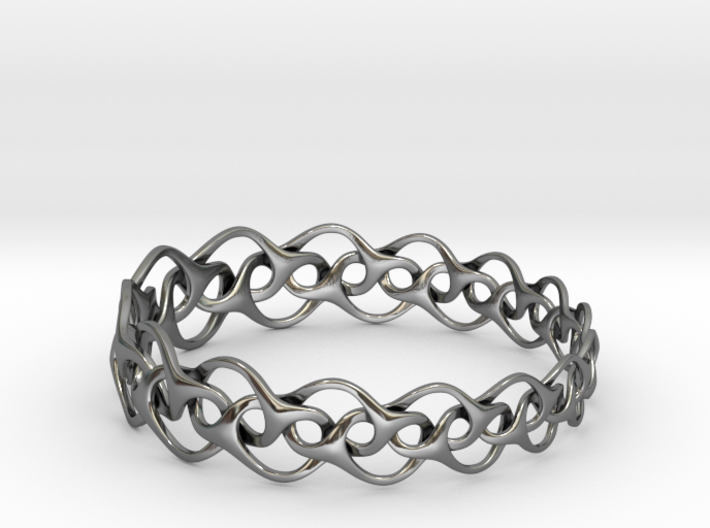 3D printed silver bracelet by Bulatov Abstract Creations via Shapeways ($60). Some people have their own 3D printers. If you don’t want to make that kind of investment, you can take your design to your local makerspace. Makerspaces have different kinds of tools and equipment available for public use, and many of them have 3D printers. You can also use a 3D printing service like Shapeways. Shapeways will not only print out your design in a variety of materials, but will ship it to you. In addition, they have an online marketplace, where you can sell your creations printed to order. 3D Printing…For Houses? How Does That Work? It works very well, as a matter of fact. And you can see for yourself, the next time you’re in Austin, Texas. That’s where the charity New Story and the company Icon have built America’s first permitted 3D printed house. The house was designed on a computer, then built with a giant 3D printer. The printer laid down layers of mortar — that is, the paste normally used to bind bricks together. This house cost only $4,000 to build, and it was finished in less than 24 hours. A giant 3D printer lays down layers of mortar to build a 3D printed house. According to New Story, the enormous 3D house printer can make a house in nearly any shape or size. Users can even design their own houses. In addition, the house printer is portable. It can also work under unreliable conditions, such as where electricity, water, and technical assistance may not be readily available. The printer runs on electricity, but it can also run on rechargeable battery power. And this is important for the company’s ultimate goal: to provide cheap, safe, sustainable housing for poverty-stricken areas around the world. Jason Ballard, co-founder at Icon, told Design Week that this technique has the potential to be ten times better than regular home construction. Here’s why. One obvious benefit is that 3D printed houses are inexpensive. Not only are materials costs lower, but there are virtually no labor costs at all. This may be bad for the construction industry, but it’s great for people who don’t have a lot of money to spend on housing. The house in Austin, for example, cost $4000 — that’s around two percent of the median home price in the United States. The Austin house took less than 24 hours to build, from start to finish. Compare that to the average of seven months it takes to build a house the traditional way. According to Ballard, the production process creates almost no waste. In addition, the mortar Icon is energy efficient. It absorbs and retains heat. It is also a very cost-effective building material. 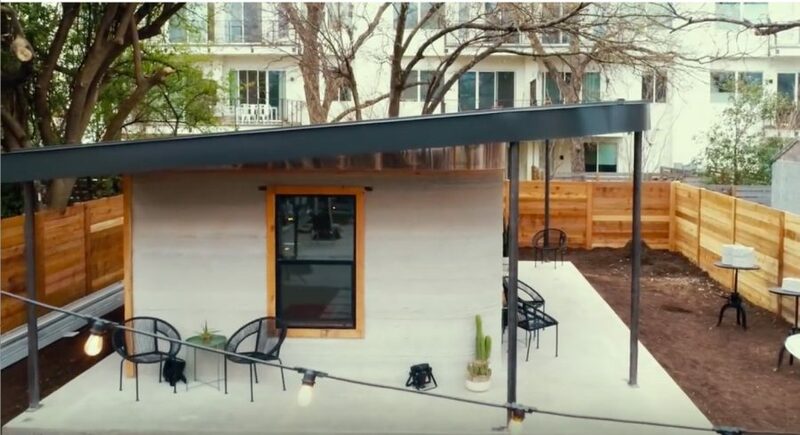 Now that they’ve produced the first permitted 3D printed home in the United States, Icon and New Story are taking their show on the road. They want to improve the house printer, then build a community of homes in El Salvador by the end of 2019. In addition, they want to develop a generator to power the printer, and explore solar power options as well. After that, they want to expand the project globally. They hope to work with governments and other charities to build shelters around the world. If you want to help New Story and Icon build sustainable, low-cost housing for poor families around the world, you can donate here. New Story is currently matching donations, up to $1 million. Or, if you prefer a hands-on approach, why not try your hand at creating and 3D printing objects? TinkerCad has free, step by step lessons, and their online software is fun, free, and easy to use. Who knows what you might come up with?